I have decided to make this YCH for free, to apologize with my watchers to be gone from deviantart for a long time. Post the references of your OC's and I will choose one of them! To participate you must be among my watchers. If you watch me now, not remove the watch if don't win the ych or if you win it. Write a journal or poll about this YCH so that other people have a chance to join aswell. And LINK the poll or journal in the comment. if you remove the watch to me I will make to win others. Add a comment below, with one or more of your characters and you can also tag a friends. 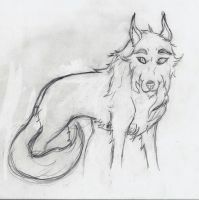 I can add particular in the character, but I will draw only canine characters (dog/wolf/fox). This is only a sketch! The BG it's the same, and I made a full shadow on it. 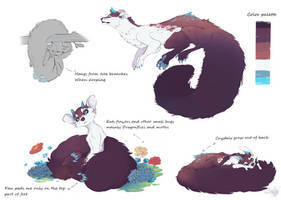 The winner will receive the full resolution of the image! -Any type of coat, long, short and medium ect. -Literally any type of canine but ONLY canine. Please,have respect for my work, don't trace them. Please have patience, I will post the final drawing a few days after the end of the aucion. If you have question, ask me. Is the winner chosen already? yes, as soon as possible I'll post the result, sorry ..
tysm! It really made my day and may I ask what made you choose my boy? Good luck to everyone who entered! 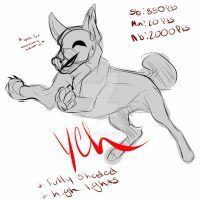 You all have some beautiful characters and I can't wait to see the results of this YCH even if it isn't one of my characters that wins! Just realised I entered wrong so here's my proper entry haha Thanks for the chance! This is exciting. Thanks for running such a great raffle! 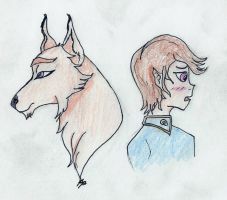 I LOVE wolves, so I'm super excited for it. Glad to see your art again! This is so great. I love that. If I do not win, maybe one day I can get a commission or so. Hey, nice to see something from you again. Oh~ and then something cool like that too. thanks for the opportunity <3 love your art btw!! i have a lot of spare points (surprisingly) & idk what to do with them so i thought i might as well host a giveaway! CLOSED! CLOSED! CLOSED! THANKS EVERYONE! RESULTS WILL BE TODAY'S EVENING! HEWWO GUYS IT'S TIME FOR THE ART RAFFLE FROM ME AND W-TOM ! !